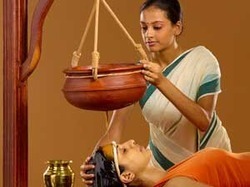 We are immersed in providing Migraine Ayurvedic Treatment Servies to the prestigious clients. To please the clients with our treatment service, our doctors attend the patients very carefully and know their exact problem. Moreover, we charge very less for treatment service. - Special Medicated oil according to the body type is applied to the head for 30-45 minutes in a special manner. Helps relieve Facial palsy, Headache, Insomnia, Improves memory, Dermatitis of the scalp, Dandruff, Other neurological disorders Paralysis, Skin disorders such as Eczema. Migraines can be nightmares. Acupuncture can help you relieve from such nightmares. By targeting specific points on your lower body which is less invasive with zero side effects, get rid of your headaches forever that too naturally and very effectively. Migraine is a very common form of headache, seen in nearly 15 % of the population. Women are more likely to suffer from migraine, than men. Usually there is a hereditary component seen among sufferers. which carries pain signals.These are done in conjunction with a program stressing muscle flexibility, strengthening, and functional restoration. The treatment aims at curing diseases of the hair, Sleep disorders, Depression, Diseases of scalp, Migraine. Special treatments are available to improve memory. Migraine is a complex neurological condition characterized by recurrent headaches causing severe throbbing, or pulsating pain on one side or sometimes both the sides; accompanied by nausea, vomiting and extreme sensitivity to light or sound. These attacks are intense enough to interfere with sleep, work, and other everyday activities. Migraine is a neurological syndrome characterized by altered bodily experiences, painful headaches, and nausea. It is a common condition which affects women more frequently than men. Frequent headaches with nausea, vomiting, visual disturbances could be migraine.